When someone hears "musical theatre", they think fun times and happiness - usually. Throw in the word "gay", and you assume you are going to be in a world of high camp fun. But not with one offering at this year's Midsumma Festival. 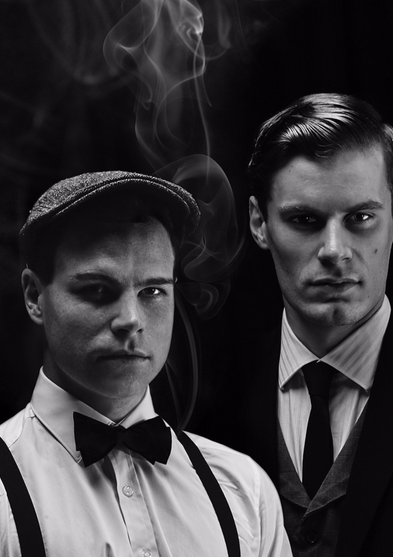 In Thrill Me: The Leopold & Loeb Story is a dark and deadly musical that retraces the exploits of the notorious 1920’s Chicago ‘thrill killers’. "It's a fast moving, very atmospheric contemporary musical," explains its director, Terence O'Connell. "The songs are incorporated into the show in a really unusual way, there are no applause spaces so the story keeps rocketing along," he says. "And it has two really hot performances from Vincent Hooper & Stephen Madsen and Daniele Buatti’s driven piano playing, melded with a great production design." Nathan Leopold (Hooper) and Richard Loeb (Madsen) as well as being wealthy young law students, were lovers and killers. The two kidnapped and murdered a 14 year-old boy in their efforts to prove their intelligence and get away with the perfect crime. It is their relationship and their actions that inspired Alfred Hitchcoks's acclaimed film Rope. "Their story is iconic in popular culture and their rather twisted relationship and the crime it produced has inspired plays, films, books, documentaries and now this musical," says O'Connell. "The show is a sequin and mirror ball free zone (ha!) and we're hoping that it will be the thinking man and woman's musical for Midsumma!" The sentiment is also shared by Hooper who relished the opportunity to perform in Thrill Me. "It’s rare that you come across a musical that deals with this kind of subject matter. The music is very interesting and the show is plot and character driven. I think it’s unlike anything I have done before, and quite possibly unlike any show that our audience has seen," he says. "I was also very excited to work with Terence. He has had an extraordinary directing career, and there is something special about working on a small collaborative project like this." Leopold is quoted as saying "the killing was an experiment" and that "it is just as easy to justify such a death as it is to justify an entomologist killing a beetle on a pin" to his attorney. He believed he possessed an intelligence that permitted him to live above the law and not abide by the rules that the rest of society did. "With performing, it’s all about empathy," Hooper explains. "Finding the moments that you can empathise with the character and personally connecting to them. Once you have found those moments, you can turn the volume up on them internally and start to see into the mind of that character. I love this process. Being an investigator, and using the script as a map into the world of these people. I think we can fundamentally all relate to any human or animal no matter how good or bad they are once we connect with their situation or behaviour." So if you're looking for something deeper and darker in your musical theatre, or even just in your theatre in general, then Thrill Me: The Leopold & Loeb Story, should definitely be on your list of shows to watch this Midusmma.